Yellow, spotted and about 12 inches long, the gecko scampered around until Camden McMillian, a Franklin & Marshall College senior, set the eyelet of a skewer before him. After a few hopeful moments, the little lizard approached the target and earned his reward – a pinhead cricket. The summer Hackman Scholar works with Associate Professor of Psychology Meredith Bashaw, who studies exotic animal welfare. Over the last few years, Bashaw has focused her research on human-animal relationships and the welfare of captive reptiles. Among other places, her research results get presented to zoos that commonly offer education programs allowing adults and children to touch snakes and lizards. 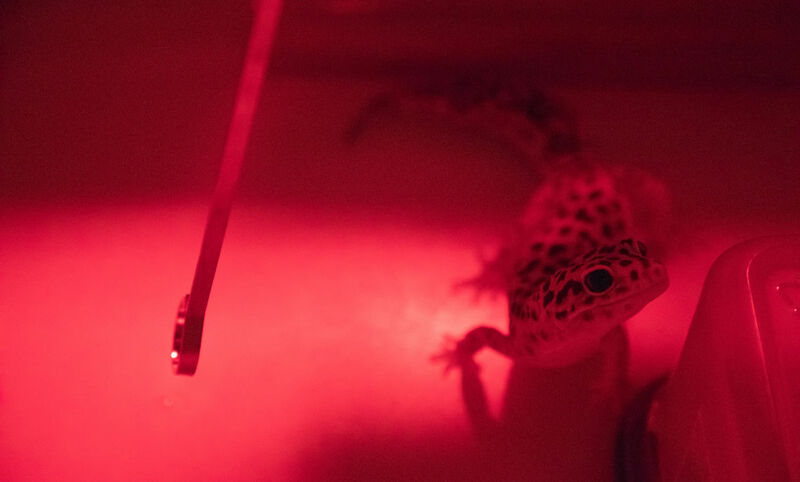 McMillian works with the male geckos, one at a time, in the reptile area of the campus vivarium, in a room lit only by red lamps so she can conduct her Pavlovian-type experiments with these nocturnal lizards while they are awake. The experiment’s ultimate purpose is to allow the geckos to determine whether or not they want to be handled by people, Bashaw said. McMillian, who is considering post-graduate studies for a career in either animal welfare in zoos or wildlife management in parks, said most of the geckos have been learning quickly.